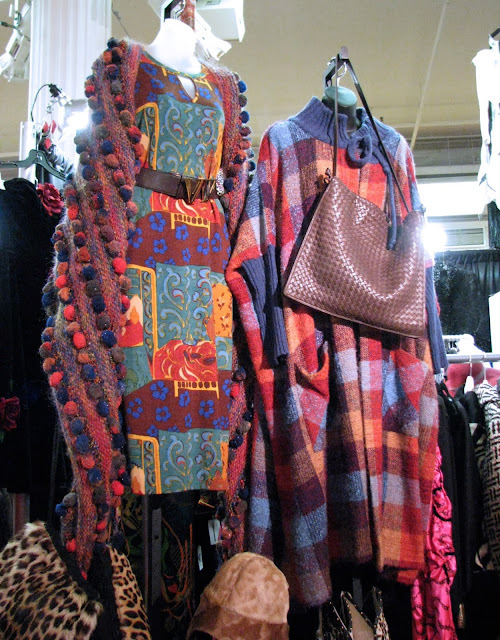 My annual trip to New York is timed to coincide with the Fall Manhattan Vintage Clothing Show and Sale, held at the Metropolitan Pavilion on West 18th Street. This year's show featured 92 vendors, offering the best in vintage clothing, jewellery and accessories for men and women from the last century. 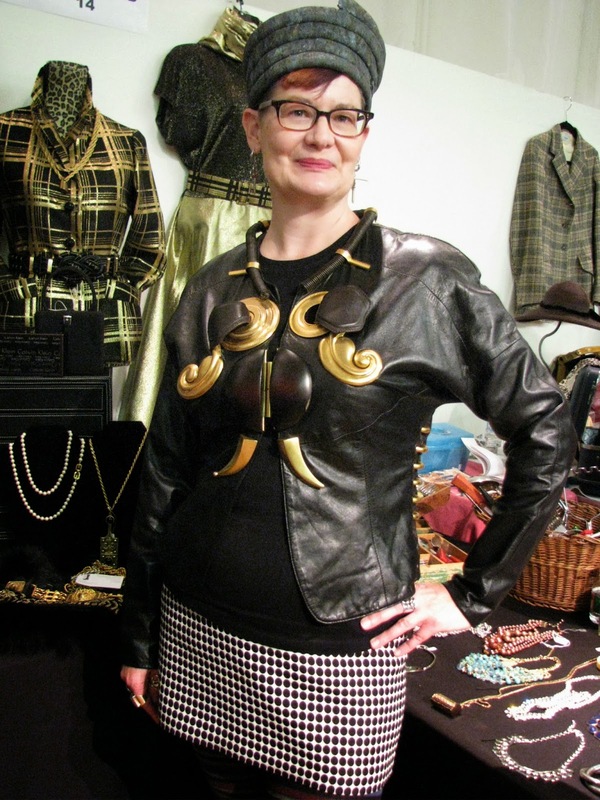 For me, the appeal of attending the show is divided equally between the opportunity to see some astonishingly beautiful fashion from past decades, and the chance to converse with other like-minded vintage fans. 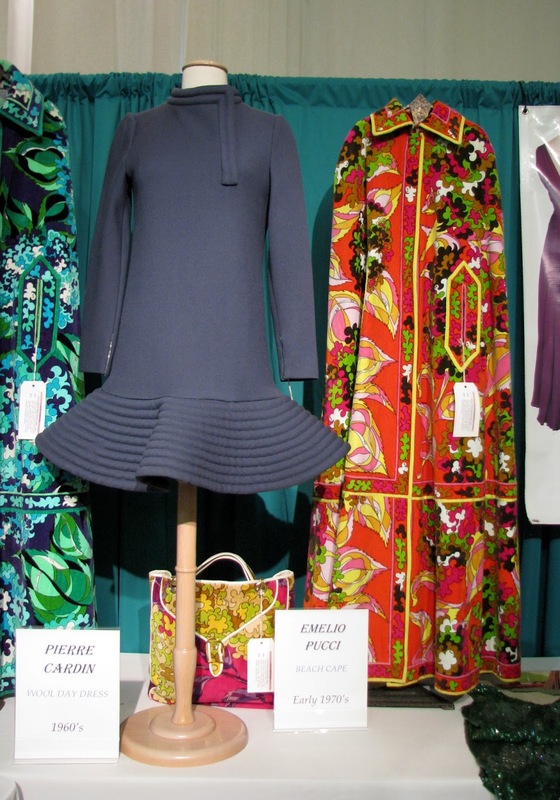 The show will often showcase the work of a particular designer, or the styles of a specific decade, and this year's show presented a exhibit of the intricate designs of Mary McFadden in the lobby. The vendors will often tailor their displays to reflect current trends from the runway. This year I saw a lot of fur, leather, sequins, and plaid. 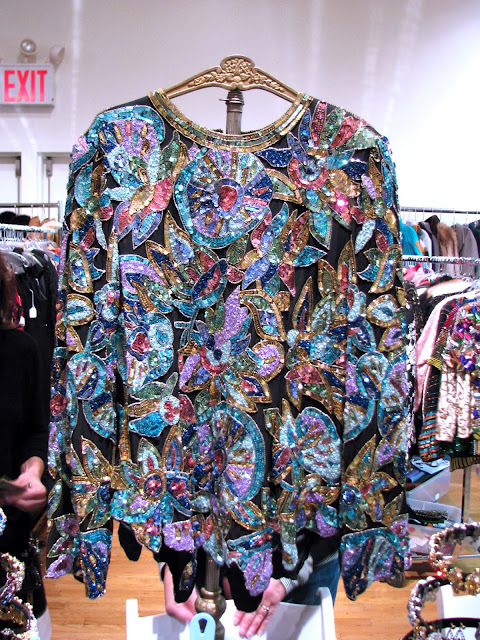 Jen McCulloch, owner of Olive's Very Vintage, enthusiastically obliged when I asked if she would hold this amazing sequined jacket so I could photograph it. The ultimate in shine, sparkle, and all out "WOW" was found in this display by Paradox Designs. A number of us who were transfixed by the Spine necklace agreed that it would look amazing hanging down the back of a long black dress. 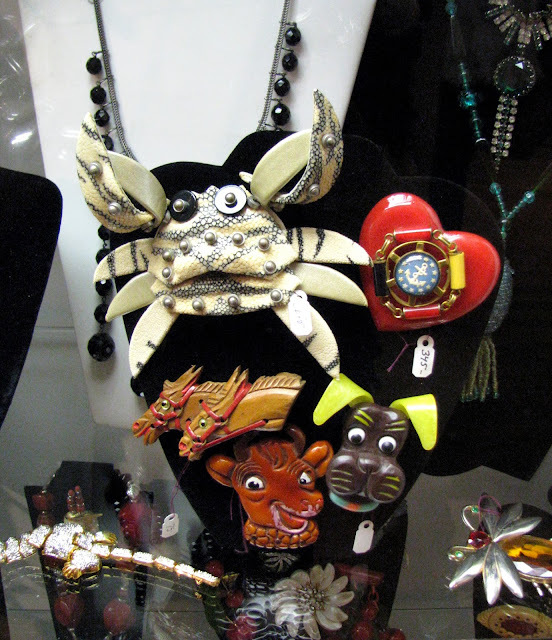 Daybreak Vintage had a huge showcase filled with eye-candy, including these fun vintage brooches. I was particularly attracted to the crab! 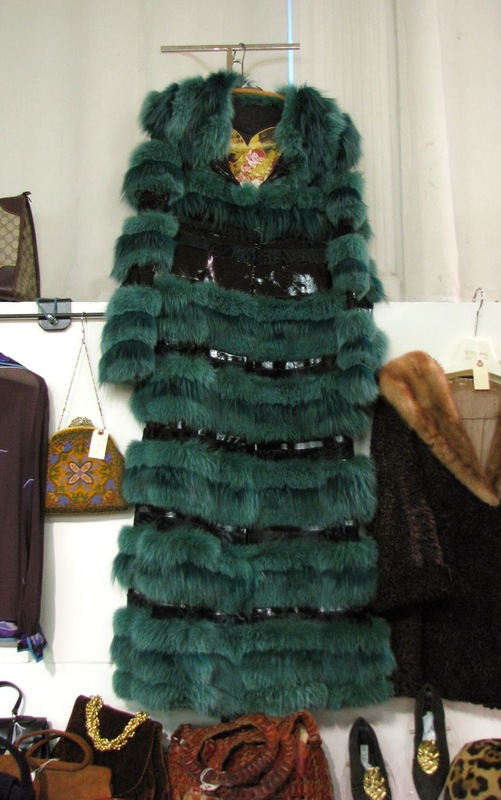 If I could haven taken home one completely extravagant thing from the show, it would have been this Yves St. Laurent ostrich feather collar from the 1950's - 60's that was on display at What Once Was. There is always an assortment of vintage footwear available. 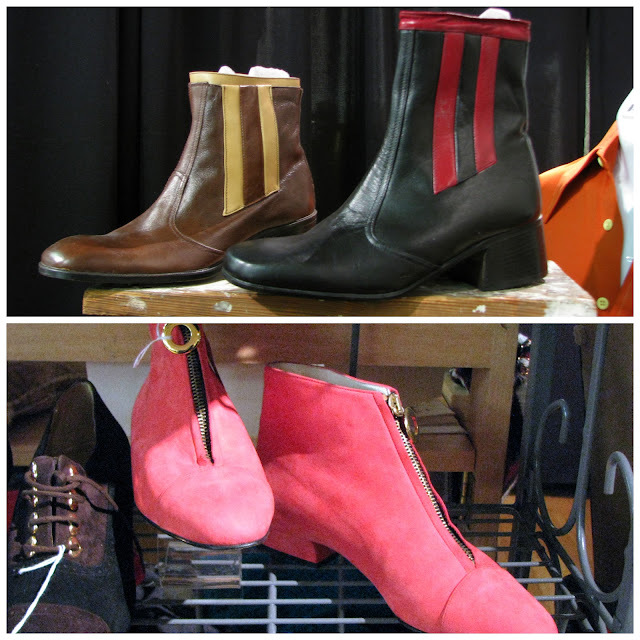 The men's chelsea boots in the top photo are dead stock from a warehouse in Detroit, available at House of Martini. The pink Escada booties are from Rhiannon's Treasures. I can see Vix, of Vintage Vixen working the fringed and studded clog boots from The Store With No Walls. The thigh-high tiger print lovelies on the right were available from Deco Etc. The Pierre Cardin dress and Pucci Beach cape are among the items that will be up for bid at a Vintage Fashion Auction on November 13th. I love the colour and shape of the Cardin dress. The proprietor of Pocketbook Vintage was nice enough to let me try this Gianfranco Ferre metal-embellished leather jacket. I'm wearing a hat I purchased from Debra Rapoport the first night I arrived in New York. Believe it or not, she made it from Viva paper towels. 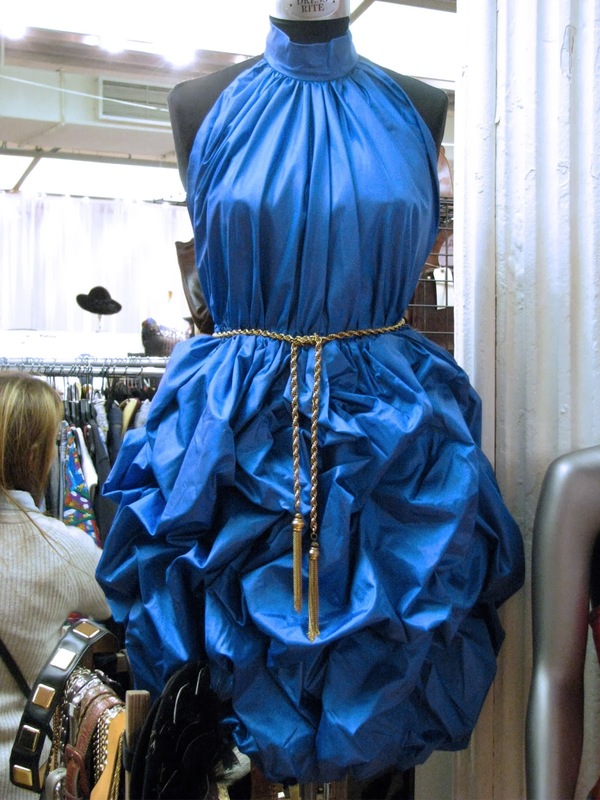 Lofty Vintage always has spectacular outfit displays at their booth. 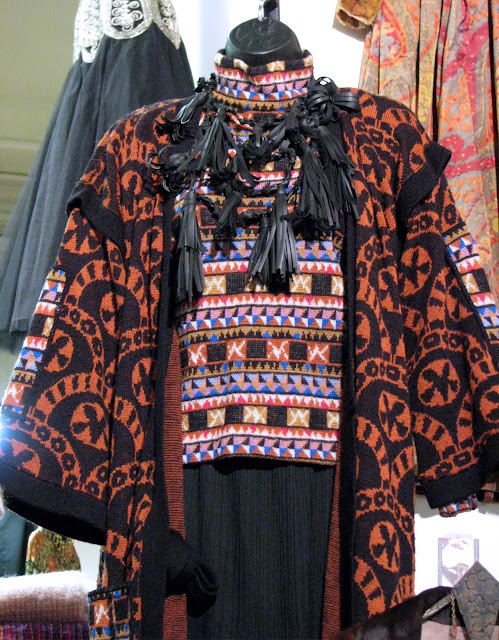 The rich colours, tribal-inspired patterns and creative accessories were perfect for the cool fall weather. The leather tasseled necklace would look amazing over just about anything. Another display from Lofty Vintage - great mix of patterns and textures! 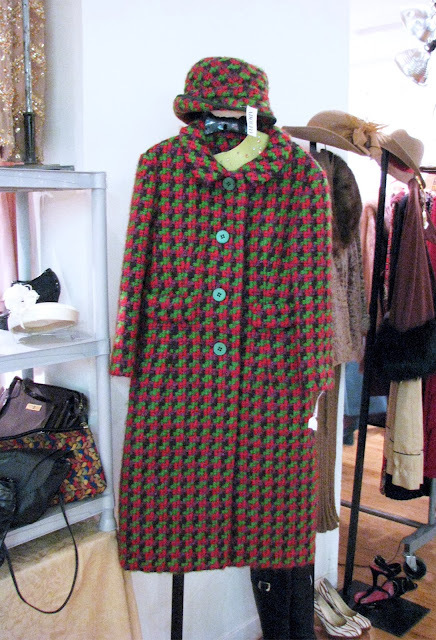 I would love to spend the winter wearing the orange/red/blue plaid coat with knit trim. 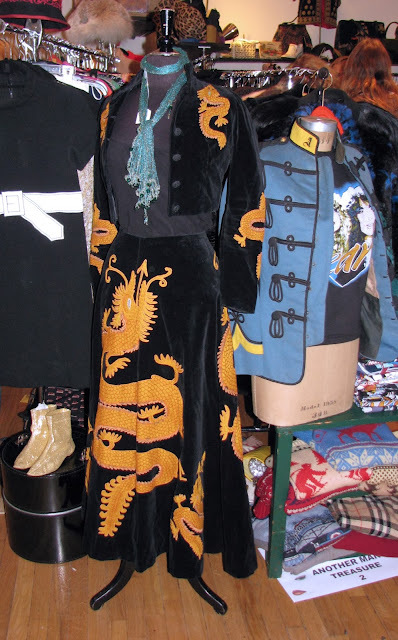 An eye-catching cold-weather themed display at The Archives which carries mens, womens and childrens vintage from the 1800's to the 1960's. 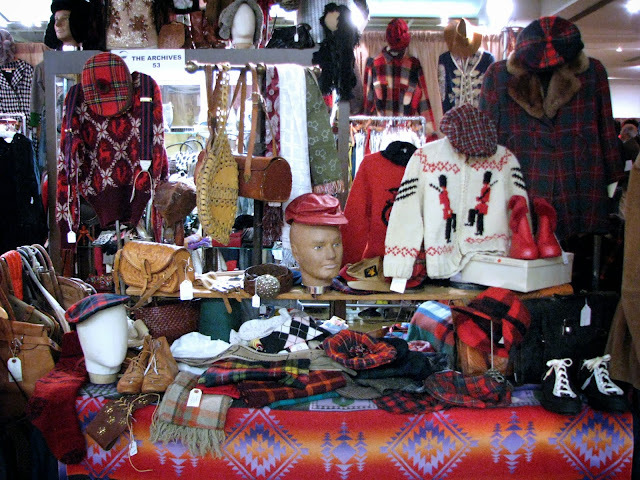 In keeping with trends from the runway shows, there was lots of plaid for sale this year. 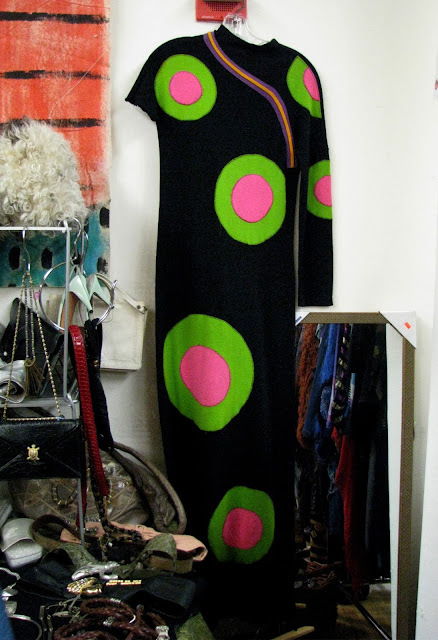 This op-art patterned dress designed by Rudi Gernreich at Marmalade Vintage sold the first day of the show. 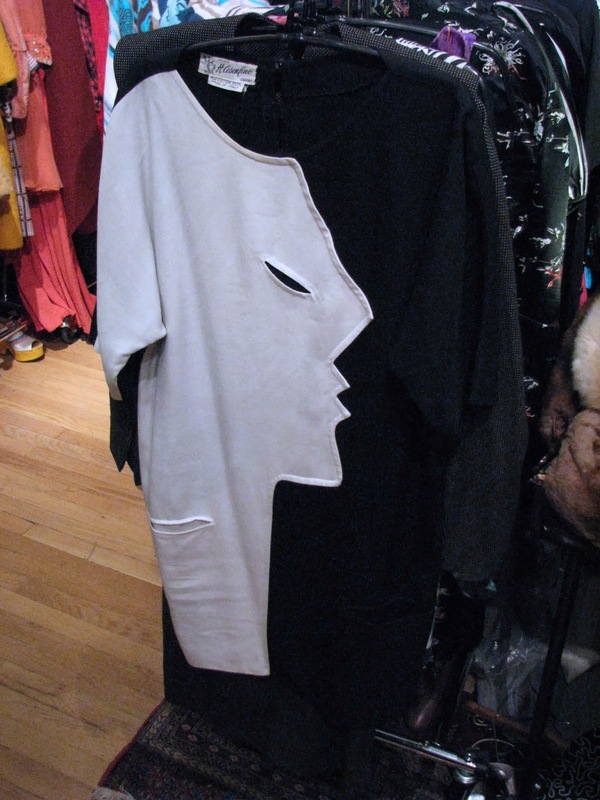 I considered trying on this graphic Italian-made cotton dress from Another Man's Treasure, but decided against it because if it fit, I'd have to talk myself out of buying it. 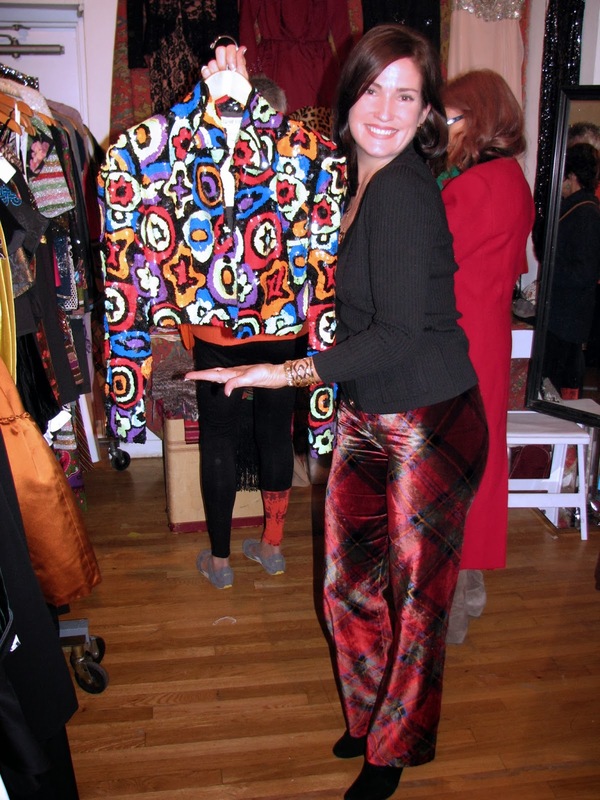 The Manhattan Vintage Clothing Show takes place three times a year, in Fall, Winter and Spring. The next show will be held January 17th and 18th, 2014. For you vintage-wearing guys out there, there is a Gentlemen's Vintage Show and Sale on November 15th. Details about locations and upcoming shows can be found here. Next post - The People! Whoa, such stunning pieces, and so many beautifully combined in displays! Amazing patterns and sequins, and the spine necklace - !! You are regal in your new Debra Rapaport hat! I'm almost glad that I don't get out much, because I'd be bankrupt and lying on the floor in a puddle of my own drool from the awesomeness. Thanks for helping us enjoy from a safe distance! Oh my gosh, I just want to swim in and start trying things on! It all looks so wonderful. Thank you for the virtual tour! 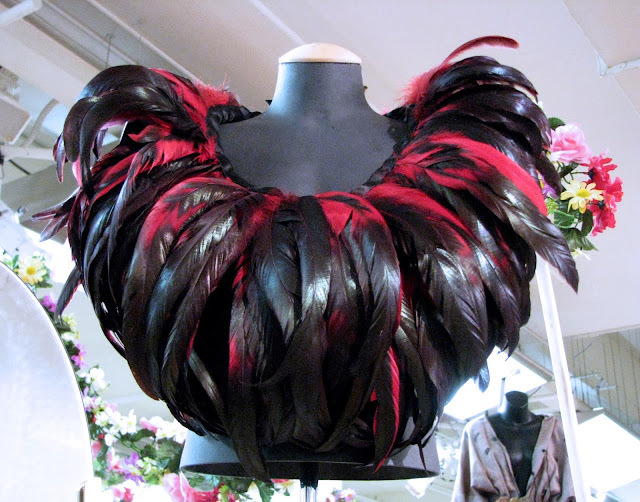 OMG, the feather collar!!!! Sublime! That feather collar is incredible. I really need to plan our next trip to NYC so I can attend. Oh, how fabulous! Thank you for sharing your incredible photos! That place looks like my spiritual home! Your photos slay me. Wow - a great Collection of beatiful clothes ! I'm dying over so much here! I swear my heart was racing when I saw those boots and even before you mentioned me - they are stupendous! 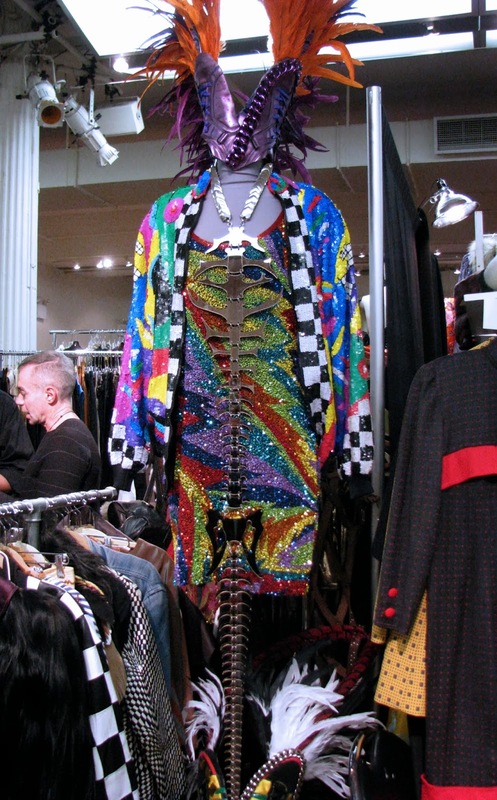 I'd also love the spine necklace, the Pucci beach cape, the op art dress, the Chinese dragon suit...just about everything! 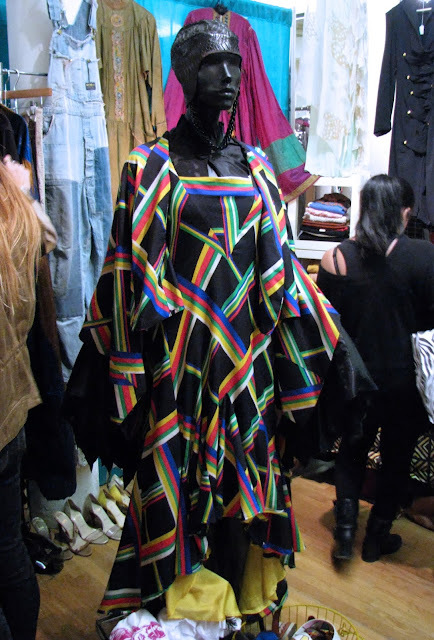 That beach cape just made me whimper for want. Great vintage here. Gah. Oh wow, i would have gone mad, all those treasures! It must have been expensive i presume? Love the Pierre Cardin dress and the Gernreich dress, so fabulous! I have seen a video on how your friend makes those paper towel hats, amazing! Oh well, i'm happy with my St-Vincent de Paul finds this weekend! A stunning review. So many pieces to drool over and you have a fabulous eye. I love the headwear made by Debra and it looks fabulous on you! Thank you so much for linking up with Hat Attack! I'm catching up, Shelley, I'm here at last! I loved your Halloween costume and the JPG exhibition post - fabulous photos of some exquisite work, and you got your photo taken with the man himself - wow! But on to the Vintage Show - sooooo much to admire and covet! As always, your photography skills make for a wonderful experience for your readers. The astonishing spine necklace, that lovely racehorse brooch, the stunning YSL feather collar, Vix's boots (I thought of her immediately too! 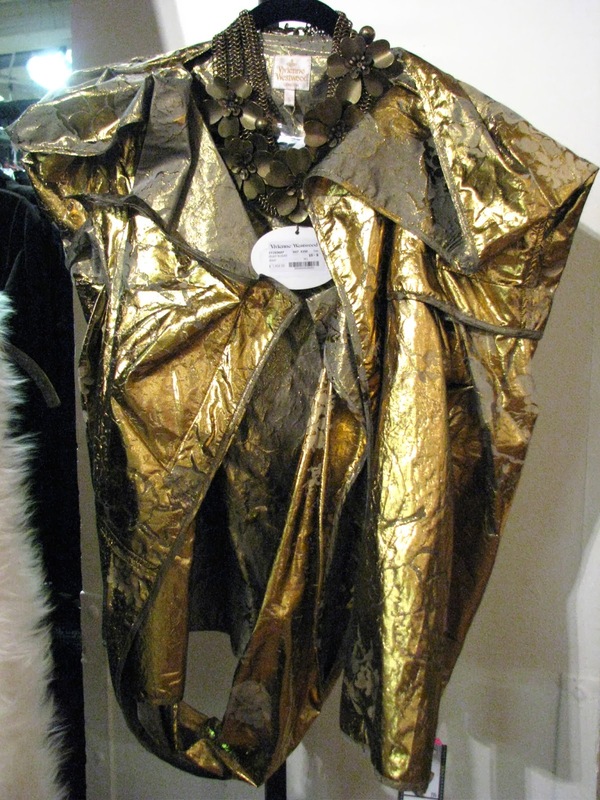 ), that fabulous leather jacket you wore, the amazing dragon two-piece - all eye-catchingly brilliant! wouuu, everything looks amazing, you look amazing!, and so pretty wearing that leather jacket and fabulous bijouterie!, love your hat!! thank you so much for sharing all of this fabulous eye-candy with us!! WOW!! Oh man... I love everythiiiing! Especial favourites: the SPINE necklace, the crab brooch, the feather collar!, the fab pom pom knit thing, the incredible Nomad dress, the STUNNING op art dress and my absolute favouritest favourite: the Pucci beach cape!!! 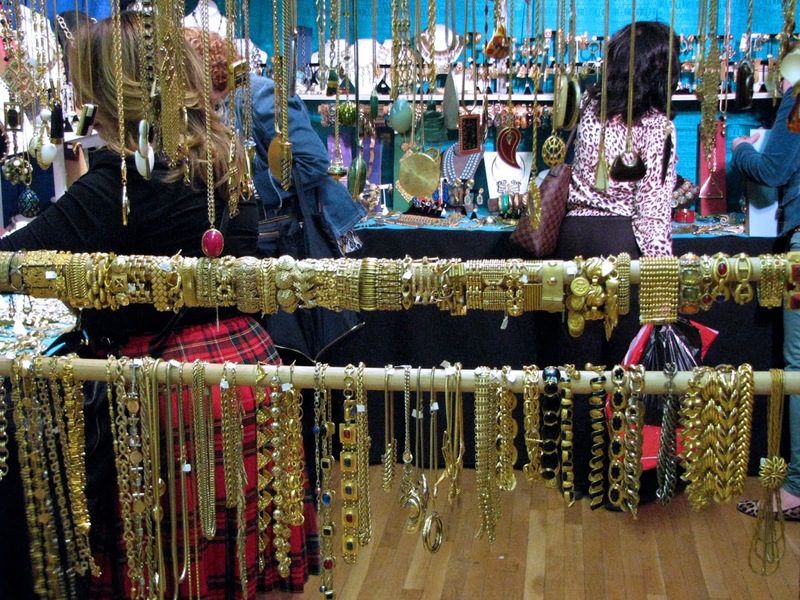 Wow - our vintage fairs here are great fun but we have very different stock - nothing like your incredible treasures! I'm chartreuse with envy! And again - you look AMAING! Did you buy that incredible jacket?? And HOW DO YOU MAKE A HAT FROM VIVA PAPER TOWELS?? ?